Buildings on Bourbon Street and throughout the French Quarter are a mixture of Spanish, French, Creole and American styles. Walled courtyards, cast iron balconies, porches, plastered walls and single chimneys reflect the different cultural influences of the place from the founding of New Orleans in 1718. Among the structures worth visiting on or around Bourbon Street are Gallier House, the Royal Sonesta Hotel, the Old Ursuline Convent, and Madame John’s Legacy. Bourbon Street bars are famous for music and their history. New Orleans claims to be the birthplace of jazz so you’ll find jazz clubs all over The Quarter. Other than jazz, music clubs will serve up blues, roots, funk, rock ‘n roll, R&B and a lot more. Jean Lafitte’s Blacksmith Shop is a popular restaurant and bar built in 1772, and the walls still whisper the legends and mystery of the New Orleans of yesteryear. Galatoire’s, founded in 1905, is famous for its Creole cuisine and is one of the “in” places on the street. The building of the Old Absinthe House, constructed in 1806, is now a bar where the famous Absinthe House Frappe was created. 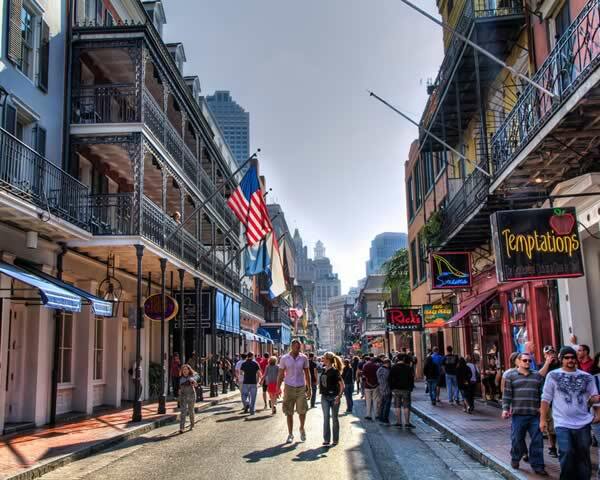 If staying put isn’t your trip, The Quarter has open container laws that allow you to drink alcohol beverages on the street, so you can enjoy your liquor amidst all the historic buildings around you. You’ll want to spend some time exploring Bourbon Street and the other parts of the French Quarter. Finding a house sitting job in New Orleans is one good way to do it. Aside from not having to worry about lodging costs, you’ll have a lot of time to catch the beat.